Hi guys, You are here because you love Clash of Clans, Right? Now what if your favorite game makers SuprCell come with the Clash of Clans PC Version. That would be total dope right. Just imagine running your Town Hall or Builders Base on a Larger Laptop or Desktop display? This would be amazing right! But unfortunately since the release of the COC game back in 2012. The developers didn’t bothered to look back at PC gamers and gift them their own Clash of Clans for PC Windows 10 Version of the game in 2019. The latest and updated Clash of Clans 2019 is even more fun. The game play has totally changed with the addition of new Builders Base. Making it the best real time mobile strategy game. Those who are still not familiar with the game. You are given a village as a base. Somehow with limited resources you have to build its defenses, grow up resources and train an army to attack your opponent villages. The more stronger and stable your army or village become. The better are the chances to get a request from a Clan to join them. Once you jump on this Clan opportunity. There is a better chance of growing faster in the game. Collectively all Clan members join their forces and with best defense and Attack strategies try to overcome their opponent’s Clan. This lead into winning the Wars and lots of bonuses for both players and the Clans. This trademark game play got so popular, that since it’s launch 6 years ago, Clash of Clans has been played on both Android and iOS smartphones. But since there is no official version of COC for Windows PC. We came up with our own tweak. This somehow made millions of COC players or Clashians play their favorite game on PC. Playing Clash of Clans for PC is more fun then ever. There are many advantages you get over your opponents if you go with the COC PC version. You will have larger screen to look on. Faster and smoother gameplay due to the better PC Specs. Easier to type while chatting with friends. Multi account login for Clash of Clans. Even better controls on touch screen laptops and 2 in 1 notebook. I have Downloaded and Played Clash of Clans on Microsoft Surface Pro 6. I have enjoyed it so much that it becomes my daily PC game. Despite the fact that COC never showed up for PC Platform. 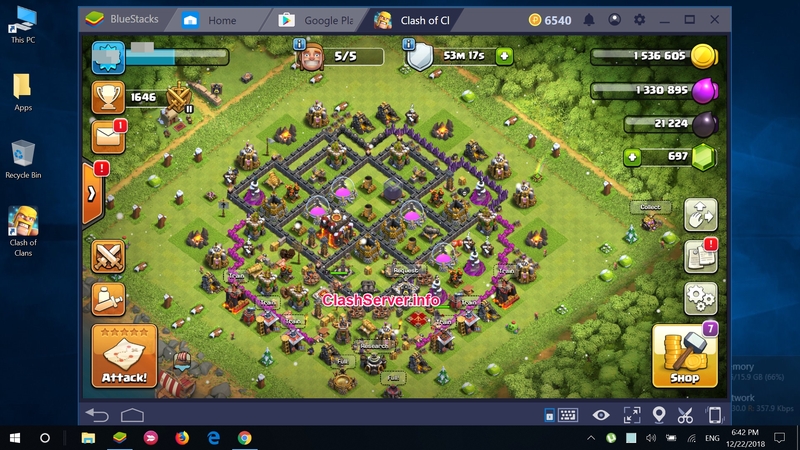 The Clash of Clans on Laptop or Desktop computers was only possible due to the availability of some of the best Android apps emulators. In my case, I went for the BlueSatcks 4, which is the latest BlueStacks 2019 version of the app. This new Android emulator based on the Android Oreo 8.0 platform makes the game play even smoother and better. Also read: FHX 2019 Clash of Clans Private Server. Can I Download Clash of Clans for PC without BlueStacks? Quite sure. You can do it easily. There are many third party Android app emulators available now. The latest and best one that I have tried so far is the NOX App Player 2019. I have played with BlueStacks but the recent annoying pop-up ads and forced Spam apps installation made me un-install the BlueStacks. But if you are ok with it you can still download Clash of Clans via BlueStacks app player. Or if you want to follow me. Go for the Nox App player. Since you are now familiar with the Clash of Clans PC version. Here I am going to discuss about the modern day Laptops, 2-in-1 PC’s to play this game well. The COC for Laptop is more fun if you have the Touch screen enabled. Because tapping around the screen to collect resources or pin-point dropping of troops is quite necessary in the game. I have downloaded and installed PC version of Clash of Clans for Surface Pro 6 Running latest Windows 10 version. To be honest here, I have played the game on my older Laptop. But the Surface Pro gives me a whole new experience of playing the game. It’s like larger screen smartphone game play experience. Is Clash of Clans coming to PC for Free in 2019? This has been the most asked question online. Although there are lots of rumors and gossips going around about the COC PC version. But still in 2019 we don’t see Super Cell doing anything about it. So you still have to use some good Emulator Player on your PC to run the Android apps and Games. Let me give you a big warning here. Never ever search for Clash_Of_Clans.exe file. There is no official *exe file of this game for the Windows running PC. So don’t fall for it. There are tons of sites which are offering the COC.exe file. But that could be anything like scam, virus, spam but not the original game. There is no way you can play this game without Android or iOS emulator Player. Now is the time to download and install Clash of Clans for PC Windows 10 or Mac computers. All you have to do is follow this step by step guide to install the game successfully on your Laptop or Desktop PC. 2)- Both of them are good players, So you can download any one of them. 3)- Once downloaded you can log in with your Google Account. If you don’t have one then simply sign up for Gmail account. 4)- After the Download and installation got completed. 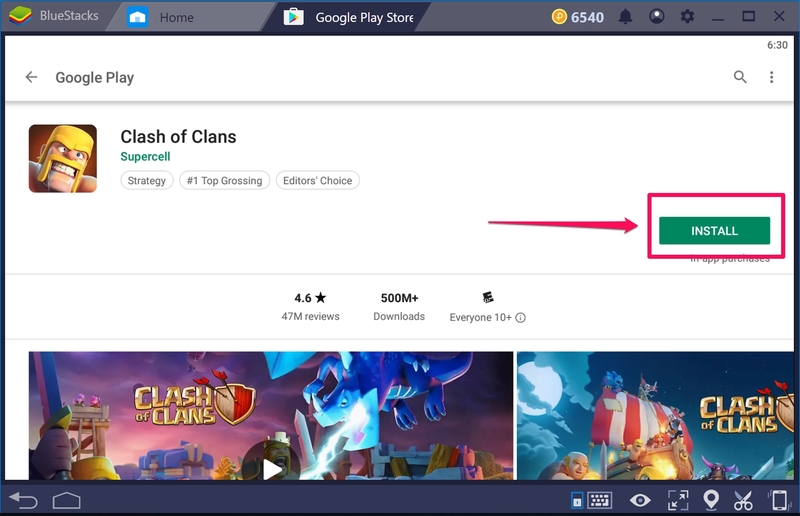 Open the BlueStacks or Nox App Player. 5)- Go to Google Play Store > Search > and type “Clash of Clans” in the search bar. 6)- Once found open the Clash of Clans page on Play store and click on green Install Button. 7)- This is the wonder time when finally you see the Clash of Clans Downloading on PC Windows 10. 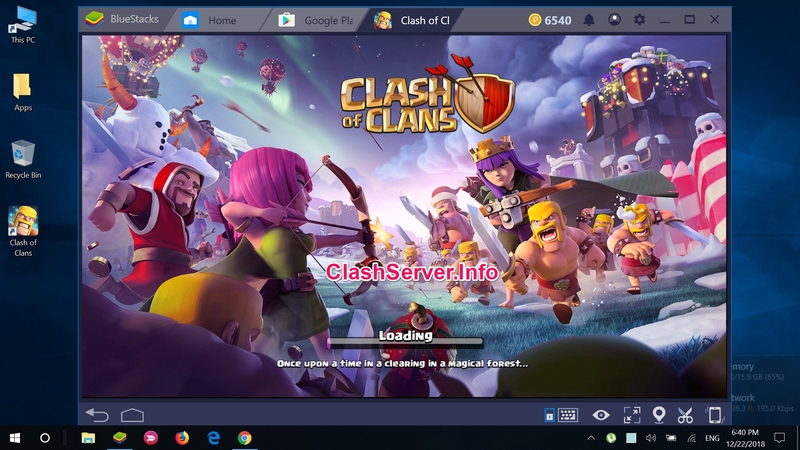 8)- Now the Magic moment arrives as you will see Clash of Clans Installed on Windows 10 Notification popping up in the right-down notification menu. 9)- That’s it now all you have to do is Click on Open and you will see the Clash of Clans Loading on your PC for the first time. 10)- Open the game. And the good news here is that you can load your own Village which you have been playing on your smartphone for all those years. That’s it. You can now enjoy playing the Clash of Clans for PC Windows 10 , i.e onyour Laptop or Desktop computer. I hope this video tutorial will help you in downloading and installing Clash of Clans on PC Windows 10/8/7/XP or even on the Mac computers. Can you Install Clash of Clans Private Servers on Windows 10 PC? Dive into the COC Private Servers category. Select any Private Server that you looking for. No open that post and Download the desired APK file on your PC. 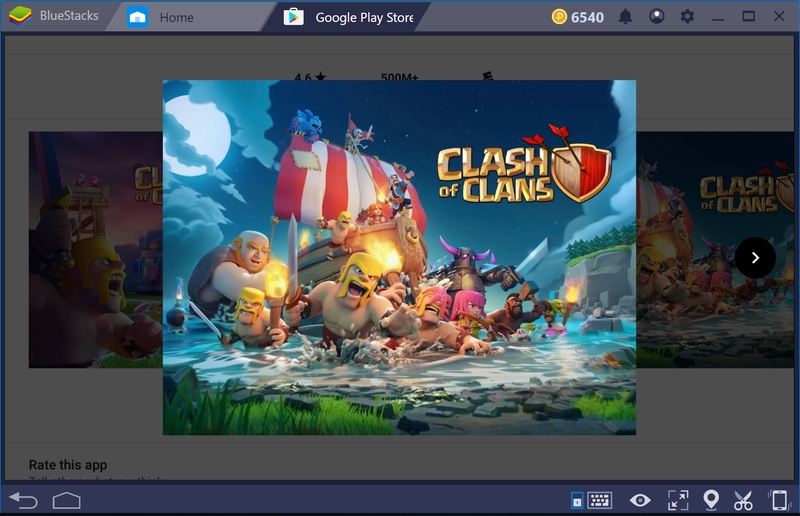 Once done simply open the BlueStacks App Player and drag and drop the download COC PS on it. It will automatically Install the file. That’s it. This is something you would never see this anywhere else. Since I have downloaded and installed the Clash of Clans on my computer. I have never played the game on my iPhone or OnePlus 6. I really enjoyed the larger display experience while playing COC. Just watch these images to know the large scale of the game. More over if you download the COC private Servers Apk on your PC Windows 10. It simply becomes GOLD. Haven’t you heard of Private Servers? then visit our homepage and enjoy some of the most tasty stuff the Clash of Clans has to offer for you.